PAPYROS Kiln Shelf Paper is a ceramic-based paper specially formulated for glass fusing. When placed between the kiln shelf and the underside of a glass project, PAPYROS prevents the glass from sticking to the shelf during firing. Because of its sturdy composition, PAPYROS provides excellent glass/kiln shelf separation on the first use, and frequently even in subsequent firings. Comes in a single 20.5" x 20.5" sheet. Shelf primer, or wash, is a high temperature, low-fluxing clay and alumina mixture in a special formulation containing suspension agents and a color coded dye that burns off at 800 degrees F. When used according to the directions on the package, shelf primer is the best insurance that your fused work will not stick to the kiln shelf. 24 ounce box. 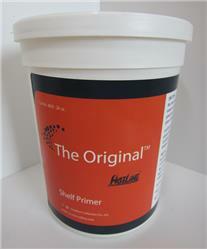 Spray A Plus Overglaze, 8 oz. This material is a so-called "over-glaze". It consists of clear, low-melting glass, ground to micron size and suspended in a spray medium. It is applied to fusing projects after they are set up ready for firing to assure against devitrification on the glass surface. In our experience, we have rarely found it necessary for projects made from the glass of Spectrum Glass Company in the small pieces used in jewelry work. If you have a larger kiln and make large pieces of fused and sagged glass, you might find this useful, especially if you intend to use some of the more exotic glasses being touted for fusing purposes. 8 ounce bottle.